Native St. Louisan and Chicago White Sox pitcher Mark Buehrle really likes dogs. In fact, Buehrle made news in December when his wife found a dog walking around St. Louis with an arrow sticking out of it and donated money to pay for the dog’s medical bills as well as found the dog a home. No word on if the dog has a comical water stream shoot out of his side when he drinks water, but it’s still a good story and makes Mark Buehrle seem like a really nice guy that cares. Yeah dude, that is “bad” to say. 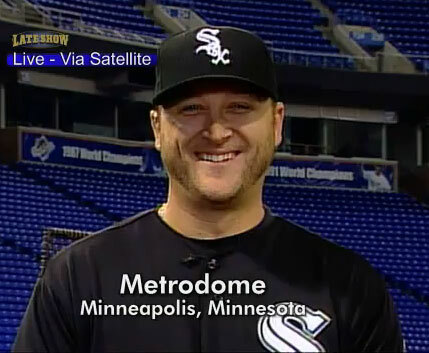 It makes you look like a moronic psycho Mark Buehrle. “…something bad needs to happen to [Vick]”?! He went to freaking jail for 2 years! Where the hell have you been dude? No one’s saying you gotta like the guy or hang out on the weekends, but the man did serve his time, and how does you publicly wishing he would get hurt help the dogs? None of this makes any sense and makes a guy that seems like a nice guy by all accounts, come off like a nutcase. Here’s an idea: Maybe you should be non-violent to all living things, instead of just the ones that lick you in that place you like when no one’s around during the off-season and you just bought peanut butter. Buehrle’s quotes where later removed from the original story by MLB beat writer Scott Merkin, but the internet has a special talent of being sticky…which explains my keyboard! Yup, that’s gotta be it. No other way it could get that way. Had to have been from the internet’s general stickiness and nothing in particular. On an unrelated note, we’re out of lotion. If you go by the store we could use some…really dry out…because of the winter and all.